The Maine Bureau of Veterans’ Services (MBVS) announces the final design selection for the new State of Maine Honorable Service Coin and Plaque, which will honor all Maine veterans, past and present, regardless of their branch or era of service. AUGUSTA, Maine — The Maine Bureau of Veterans’ Services (MBVS) announces the final design selection for the new State of Maine Honorable Service Coin and Plaque, which will honor all Maine veterans, past and present, regardless of their branch or era of service. The winning design was submitted by Georgette L. Kanach of Gray, Maine, submitted the winning design, which was chosen by popular vote of more than 1,200 Maine veterans. U.S. military members have a longstanding tradition of carrying special “challenge coins” to symbolize branch and unit identity and foster esprit de corps. In 2002, the Maine Bureau of Veterans’ Services commissioned the first of four bronze plaques that now hang in the Hall of Flags at the Maine State Capitol, each representing veterans who served in World War II, Korea and Vietnam, as well as women veterans. Likenesses of each of the four plaques were made into coins that are regularly presented to Maine veterans based on their era of service. 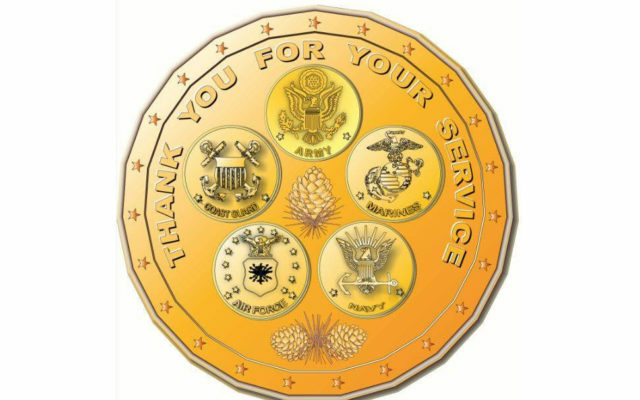 As many other Maine veterans have served during peacetime and in conflicts other than World War II, Korea, and Vietnam, the Honorable Service Coin was commissioned to honor those veterans who would otherwise not be eligible to receive one of the four previously existing coins. A matching plaque will also be hung in the Hall of Flags at the State House in Augusta. Kanach is the mother of two veteran daughters; grandmother to two veteran grandchildren; sister to four veteran brothers; and aunt to many nieces and nephews who have served and who are serving in the military. She said her greatest honor would be to one day present each of her daughters with an Honorable Service Coin. A formal unveiling ceremony for the Honorable Service Coin and Plaque will be announced.